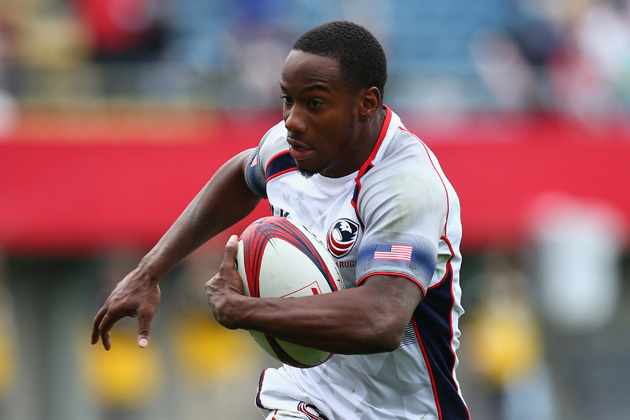 Former sprinter Carlin Isles switched to rugby and joined a new growing movement of young athletes looking for a change, particular in rugby. Isles is now the world's fastest rugby player and will fulfill his Olympic dreams at the Rio 2016 Olympics. It was June 2012—just two weeks before the sprint trials for the London Olympics—and Carlin Isles was determined to get faster. One night after grueling training, the sprinter, ranked nationally at 36th, turned to the Internet for videos of sprinting techniques he could adopt and master before the trials. But it wasn’t ordinary sprinting clips that ultimately caught his attention. While browsing the web, Isles stumbled upon rugby footage and was immediately intrigued. Though his personal best of 10.13 seconds for the 100 meters would have put him in the semifinals at the 2012 Olympics, Isles did not end up making the trials, let alone secure a spot in London. Those online clips sealed his fate: he abandoned his path towards sprinting history to start another in rugby less than a week later. After speaking with CEO of USA Rugby Nigel Melville the following day, Isles packed up his belongings and drove from Austin, Texas, to Aspen, Colo., for his first day of rugby training in his life. By switching to rugby, Isles, who comes from a family of 11 children in Massillon, Ohio, simply joined a new growing movement of young athletes looking for a change. Rugby enrollment grew by 81% from 2008-2013 according to the Sports and Fitness Industry Association, making it the fastest growing sport in the last seven years. Its sevens variation, meanwhile, is both the fastest growing youth sport with a 25% increase and collegiate sport for men and women with 900 programs. Professionally, the USA Eagles now stand in the Top 20, and the Eagles Sevens recently won the HSBC Sevens World Series in London. Clearly, USA rugby is but a sleeping giant, a sport whose participation and viewership continues to grow at an accelerated rate. As one of many experienced crossover athletes, Isles was hardly unfit for rugby boot camp. 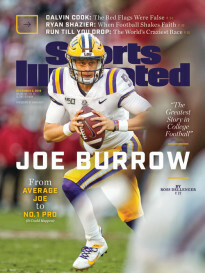 Before training to be an Olympic sprinter, he competed in football player and track and field on scholarship at Ashland University, a Division II school in Ohio. On the football field, Carlin was an all-conference, all-county selection and holds school records for most kickoff return yardage in a game (174 yards) and longest kickoff return for TD (100 yards), and on the track, he was an All-American in the 60m dash and ran a personal best of 6.68 seconds, a school record. “I knew [rugby] probably wouldn’t be easy at first, but if I worked hard, and I knew what I wanted, it would happen,” Isles admitted. USA Rugby emphasizes to athletes like Isles that the game’s principles mesh perfectly with the American disposition and traditional repertoire of sports: individual talent in a team context, fair play, and respect in a fast and aggressive environment. 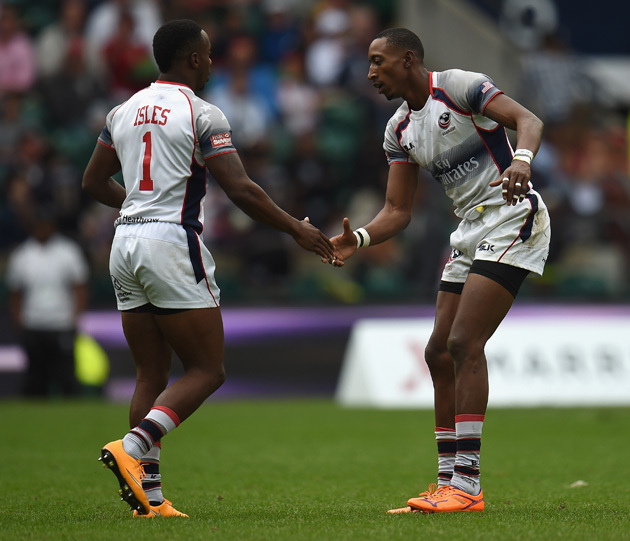 Eagles Sevens head coach Mike Friday said, “Rugby complements, rather than competes with, American super sports. 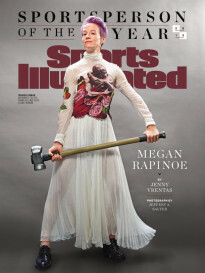 It allows athletes to improve their skills.” While the rules of rugby are intricate and unique, the game itself is fundamentally a dynamic hybrid of the various sports that Americans follow like a religion: It combines the quickness and subtleties of basketball; the strength and physicality of football; the endurance of soccer. Isles made rugby fame in no time, thanks to a YouTube highlights reel called “Carlin Isles: Olympic Dream.” In less than three minutes of film showing the athlete score mind-blowing tries as opponents comically trail after him, Isles created a new legacy for himself as “the fastest man in rugby.” The stats don’t lie: he competes favorably against stars of the NBA, NFL and even against the great Usain Bolt. He was an overnight sensation—the video has had more than six million hits, and that number grows daily. “I wanted to be the world’s fastest rugby player—and now to have that title is an honor,” he said. But this accomplishment was only the beginning of his rugby career. After his training with the Gentlemen of Aspen Rugby Football Club, Isles earned a Residency contract with the Men’s Eagles Sevens, the team he now plays with as wing. He was one of the leading try-scorers on the Eagles during the 2012-13 IRB Sevens World Series and returned to the Olympic Training Centre in 2014 following a stint with the Glasgow Warriors of the Guinness Pro12. Such a sentiment is not unique to Isles. For his teammate, Madison Hughes, who is currently both the Sevens and Dartmouth Captain, the rugby brotherhood has been instrumental to academic success juggling his professional career and social and academic pursuits. With rugby’s inclusion in the games for the first time since 1924 and the U.S.’s accepted bid to host the 2018 Men’s Sevens World Cup in San Francisco Bay Area, Americans are now more than ever paying attention to the long-overlooked sport and bringing the U.S. into a new era of athletics. Despite the possibility of winning a medal in Rio, Isles maintains that giving hope and motivation to people interested in trying rugby is and will always be his main objective. Through his successful transition to rugby, he hopes that he can inspire other athletes to open their eyes to all rugby has to offer. Those players constantly chasing him down the field might feel differently.